The National chairman of the Social Democratic Party (SDP), Olu Falae has quit active politics citing health challenges as the reason for his decision. He however said he would retain his position as head of the SDP while Tunde Adeniran will be the defacto chairman of the party. The development comes less than 24 hours after his party endorsed President Muhammadu Buhari for the February 16 presidential poll. The party made the decision during its national executive council (NEC) meeting in Abuja on Thursday. Olu Falae had earlier endorsed Atiku Abubakar, presidential candidate of the Peoples Democratic Party (PDP), asking Nigerians to vote out Buhari. 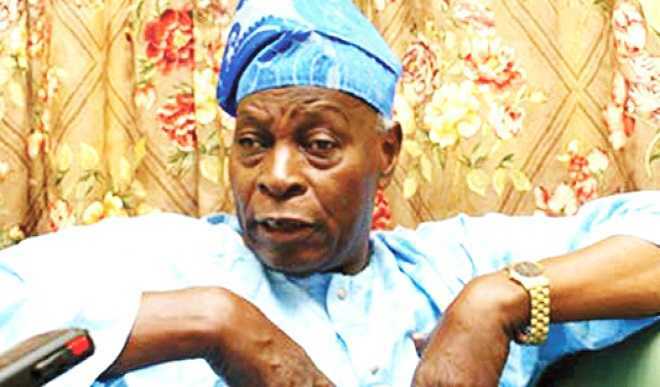 Speaking when Titi Abubakar, wife of the PDP presidential candidate, visited the leaders of Afenifere, the pan-Yoruba socio-political group, to solicit support for her husband, Falae said it was clear that many Nigerians do not want the government of Buhari to return. “All hands must be on deck by to ensure that President Muhammadu Buhari does not come back for the second term. We have to find ways to do it, this government must not come back, for the sake of all of us, even for the sake of the man (Buhari) himself. He does not have the clue of what is going on again, I don’t think he is well, he should just go home and rest. Some characters are hiding behind him to do evil.” he had said. Olu Falae had said he was on the same page with Atiku, asking PDP leaders to work together in order to achieve results. Jerry Gana, former information minister, and Donald Duke, former governor of Cross River, a were laying claim to the presidential ticket of Falae’s party before the adoption of Buhari as the party’s consensus candidate.